This blog follows on from the previous blog about how to set up Selenium Grid for WebDriver or for Ranorex Web Testing. These instructions show you how to also include the Microsoft Edge Browser in your established Grid running on a Windows local host machine. Extract the executable to the same directory as your other WebDriver Browser Servers. Now start the Selenium Server, just as we did in the last post. Just running on the local host. Add a default node to the grid, just as we did in the last post. Now we are going to add the Edge Browser as a node in its own right. 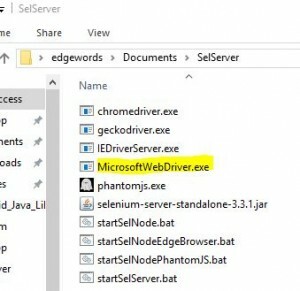 So we add a new node to the same grid, but on a different port number to our default node from step 3.
cd C:\Users\edgewords\Documents\SelServer java -Dwebdriver.edge.driver="C:\Users\edgewords\Documents\SelServer\MicrosoftWebDriver.exe" -jar selenium-server-standalone-3.3.1.jar -port 5556 -role node -hub http://localhost:4444/grid/register -browser "browserName=MicrosoftEdge, platform=WINDOWS, maxInstances=10"
-role node -hub http://localhost:4444/grid/register -browser "browserName=MicrosoftEdge, platform=WINDOWS, maxInstances=10"
Note, the port number I have used here is 5556. Also note that the command line above that starts with ‘java’ is over two lines, but is one line of code. Now we should have the Grid running with two Nodes. One Node on port 5555 for our default browsers, and a second on port 5556 for our Edge Browsers.